An oddly designed, slightly uneven show piece of a gaming PC. A beautifully lit, well specced PC at a fairly competitive price, the Lynx comes with a few unfortunate wrinkles that keep it out of the elite prebuilt conversation. Digital Storm, which has built a reputation as a prebuilt manufacturer that leans heavily into flashy gaming PCs, has added an additional tier to their gaming PC offerings, the Lynx line. Lynx offers buyers a wide range of options and price points, though every machine has dedicated graphics, including the least expensive offering at $799 which sports a GTX 1050. 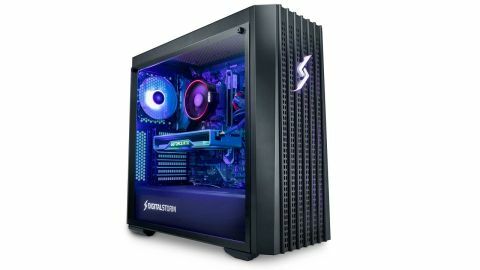 The line has a high ceiling, though, and the build Digital Storm sent us for review was the $1,999 offering, which packs a ray tracing ready RTX 2070 and a powerful Core i7-9700K processor. It offers fairly limited overhead for further upgrading or adding additional components, but out of the box is ready to crush most games at 1440p Ultra and can stretch into 4K if you're willing to tweak down some of the more demanding visual settings. It's also priced very close to what it would cost to build the same rig yourself. Putting together a very similar setup on PC Parts Picker yielded a price tag of $1,911, only $88 less than the Lynx. Impressive. The i7-9700K stands out a bit in a gaming PC, given how many OEM builders in this range are opting for an i7-8700 or a Ryzen 7 2700X to shave $40 to $80 off the final price without a massive performance hit. Given that the Lynx and its equivalents are squarely marketed at gamers, it's surprising to see them opting for a slightly more powerful CPU and slightly less powerful GPU. The Omen Obelisk, for instance, retails for $100 more and is similarly specced, but opts for an i7-8700 and a RTX 2080, a graphics card that retails for $200 more than the 2070 in the Lynx. The takeaway is that the Lynx slightly outperforms some of the competition in productivity terms but lags behind a bit in gaming applications. To continue the Obelisk comparison, the i7-9700K in the Lynx clocks in at 1525 in multicore benchmarking in Cinebench to the Obelisk's 1385, but the Obelisk managed an average 39 FPS in Shadow of the Tomb Raider at 4K Ultra and 89 FPS at QHD Ultra while the Lynx drops backs to 23 FPS and 49 FPS respectively. For workload and productivity the Lynx is demonstrably a more efficient machine, but for gaming the Obelisk (and similar RTX 2080 powered builds) significantly edge it out. It's a fine line, but one that a buying decision at this price point often hinges on. Case design and lighting is another differentiator amongst the top gaming PCs, and as is the Digital Storm tradition, the Lynx tends generously towards the RGB extravaganza side of the aisle. While the case itself is a bit unfortunate (I'm not a fan of the cheap looking white Digital Storm logo plastered on it, or the pock-marked looking, slatted design of the front panel), the lights beaming out of it in every direction are very eye catching. The effect is boosted in large part due to the abundance of ventilation holes, even on the unappealing front panel, though from the profile it's absolutely gorgeous. A pane of tempered glass looks on the glowing interior, where colored lighting dances enticingly over the pulsing performance parts. It falls just short in terms of spectacle of the best-in-class Corsair Vengeance 5180, but it's still an impressive show piece and manages to utterly captivate my light- and shadow-obsessed cat every time I power it on. It's also $400 less expensive than the Vengeance, but lacks its 2080 GPU and dual chamber, cable management conveniences and accessibility. The Lynx does come with some nice quality of life features, though. For one, the major ventilation areas on the top and bottom of the unit are shielded from dust by filters, a good start towards keeping that glowing interior clean and free of grit. And it runs pretty quietly, even under demanding GPU and CPU loads, so it'll fit in even in an office environment or, at the very least, won't distract you much while you're gunning down Nazi aliens. Case access is toolless—you just need to remove a pair of thumb screws on the tempered glass panel, but again this only gets you access to the main bay, not the area where the drives are tucked away beneath the PSU shroud. The Lynx is a bit of a strange cat, a gaming PC that focuses slightly more on productivity, but it's priced very well and includes a solid 3 year limited warranty. If you're still fixed in the 1080p era or are looking for a machine that will capably handle 1440p for some time to come, the Lynx is a good choice, particularly if you're infatuated with RGB light shows.